You may remember the name Noelle Stevenson from a previous post. She is one of the geniuses behind Lumberjanes (she also illustrated the cover of Fangirl by Rainbow Rowell, which compliments that book perfectly). You may also be familiar with her work Nimona. I had seen a bit here and there, but never sat down to experience the full adventure. In May, the web comic was turned into a printed, physical book (insert your oooohs and ahhhs here, ladies and gents). Recently, I made my way to the top of the Nimona library queue for the complete volume and confetti rained from the sky. Well, it felt like it, especially when I started reading this utterly delightful book (see Bandette, Vol 1 for my opinion on delightful books). 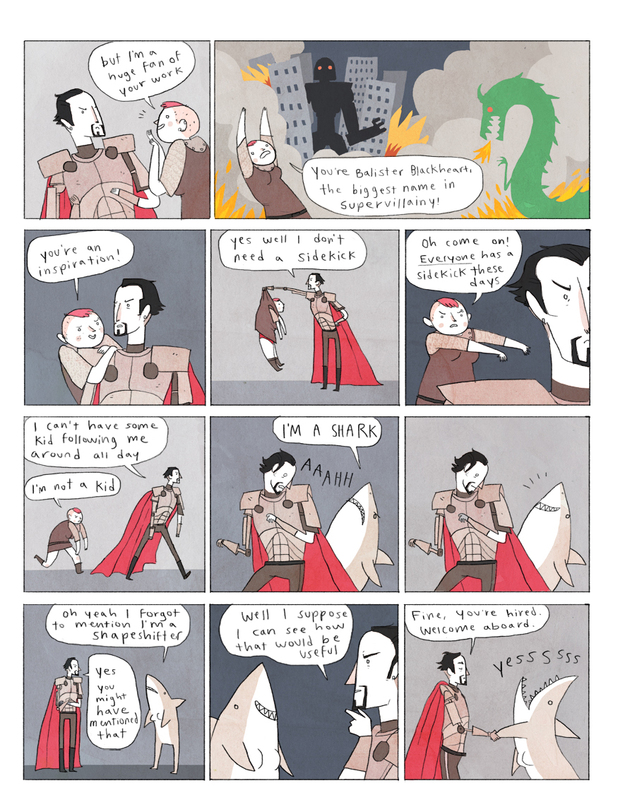 Nimona is a shapeshifter who convinces Lord Ballister Blackheart to take her on as his sidekick. Even though he is a super villain, he likes to stick to "the rules." Nimona, on the other hand, is a cut to the chase, break the rules, and get it down with flare sort of person. This at times annoys both Blackheart and Sir Ambrosius Goldenloin of the Institution of Law Enforcement and Heroics (and the entire Institution of Law Enforcement and Heroics as a whole). The comic really brings out what makes the "good" guy and what makes the "bad" guy, as it turns out the Institution has some dark secrets of its own. Then throw in how Blackheart and Goldenloin were once friends but became enemies after a mysterious accident. 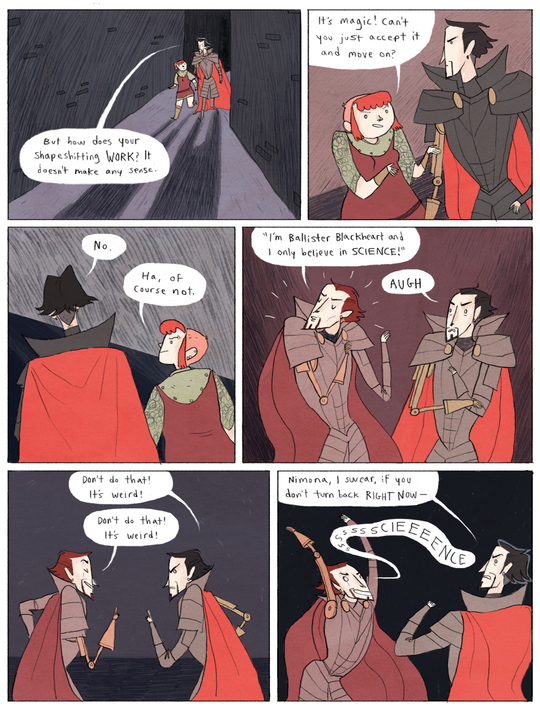 Nimona throws a wrench to the way things are done and her gusto attitude is exactly what Blackheart needs. 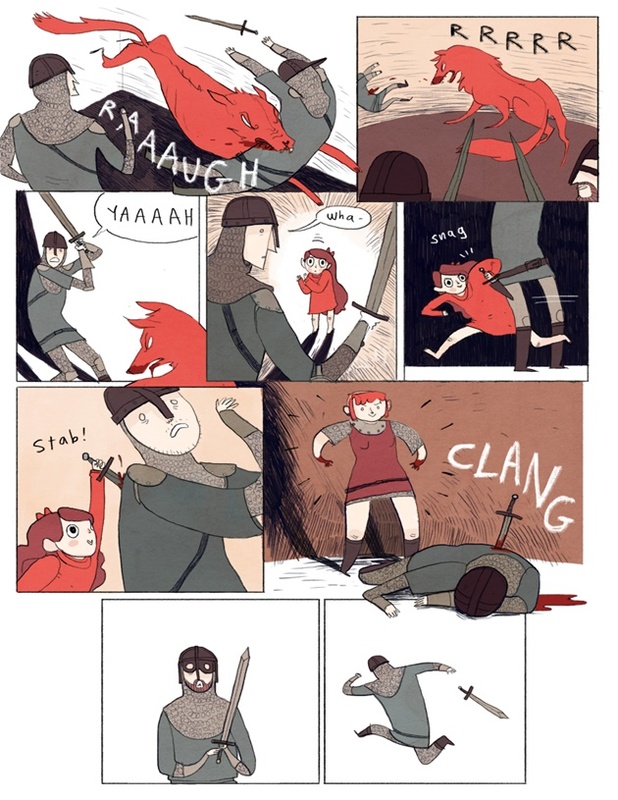 Noelle Stevenson's writing is funny and charming, and as always, her illustrations are perfect. I really do love the color palette, which I always think is worth mentioning - she goes with a specific palette and sticks with it, a trait used by many of my favorite illustrators today. I have included a few pages below, in case you still need more enticing. Nimona is an amazing comic and I hope you will give this characters a chance. You can keep up with Stevenson's work via Twitter (she kind of rocks at Twitter- check out her male model commentary sometime) or her website, which includes more comics and illustrations.